Improve: Why must the stock market implode? On the surface, the upward move has simply gone on longer than usual and that usually ends in a "correction", i.e., a fall in prices that entices buyers that felt left out of the earlier rally. Such a correction typically means index depreciations of 5-20 per cent. 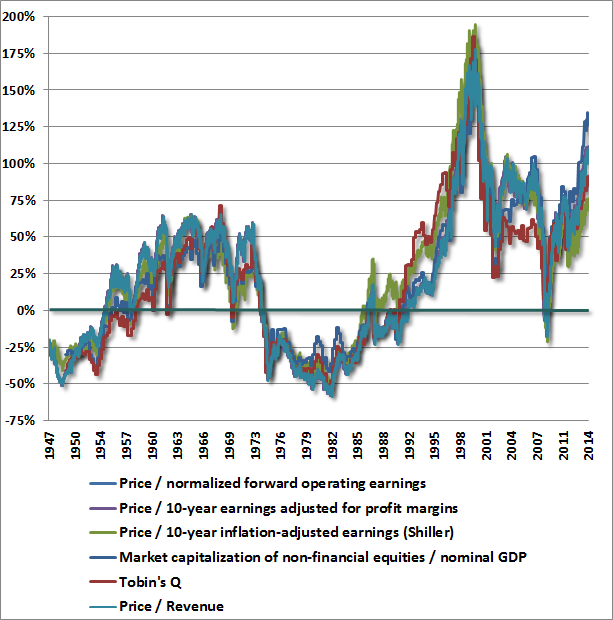 Going a little deeper, stocks are extremely expensive viewed from a historical perspective. Bull markets have never taken off when stocks are expensive, and if it's not a bull market it tends to be a bear market. So, what do the market factors look like today (August 4, 2014)? Before the market open today, the S&P 500 index was just -3.3% below its intra day all time high on July 24. That is not even a correction by conventional standards, just a residual fluctuation. It is definitely not enough in itself to push the market into a self-reinforcing feedback loop of selling. Further, at the July 2014 peak, the S&P 500 had risen by +199% (not counting dividends) since its low on March 6, 2009. Right now, before the open, the appreciation since the low stands at +189%. Apart from the relatively mild corrections of 17.1% in 2010 and 21.6% in 2011, the upward move has exhibited a straight diagonal line going on for 65 months. It is not unprecedented in history but previous similar instances has usually been resolved by market crashes. There is no reason to think this time is different. Margin debt at NYSE is at all time highs and showing a similar pattern as it did around the market peaks of March 2000 and July 2007. Central bank debt and government debt in most major countries are above all conceivable historical highs, and we haven't even had a WW III yet. Most western countries still run a budget deficit, despite 5 years of cyclical upswing. That will not look good when the economic downturn finally comes. Actually, even corporates exhibit record high debts after a decade of low interest rates that encouraged borrowing to buy back stock to window-dress earnings per share numbers. As for individuals, they keep living at best hand to mouth due to low labor participation rates and high true inflation, and otherwise living off of food coupons, and student and car loans. And, yet again, that is in the current very mature positive phase of the economic cycle. When things turn down, leverage will start to look even worse than it already does. Less cash flow from less work. 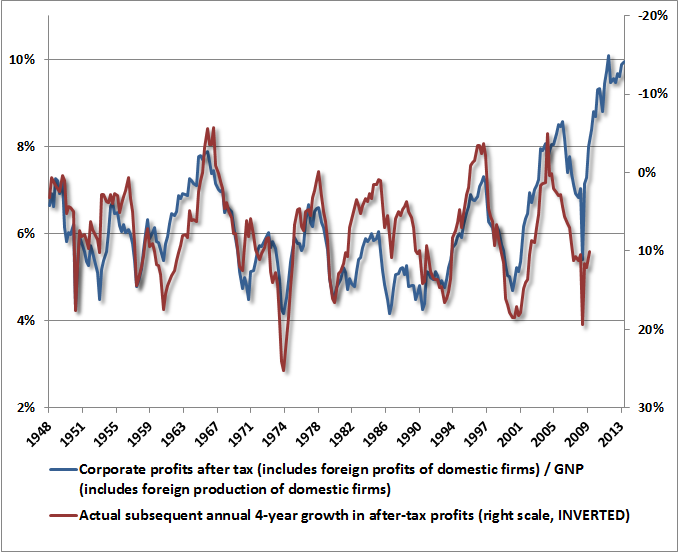 Less cash flow from lower corporate profits. Less stock value to support margin debt on equities. Asset values will fall, chas flow will fall and it will be all the harder to revolve loans falling due. It happened just 7-8 years ago and sadly it will happen again quite soon. Even some central bankers have realized they can't repeat their variant of the magic Indian rope trick again. Central banks and politicians pumped the market and the economy as extremely as they ever could and here we are with record debts everywhere and zero interest rates. Soon it will be time to pay the piper and no margins of error anywhere. What worries me is that it might get so ugly that all bets are off, that not even an honest short seller like me will be allowed to profit from the downturn, despite the community service I have provided in warning about pumping the bubble from the beginning. Many market players ridicule the notion of equity valuations. And yet valuation is the only thing that has a historically reliable track record of forecasting future stock market returns. Valuation works in very long cycles and does not affect your year to year returns at all, but over full cycles of 7-15 years, fundamental valuations seem to be all that matter. Make no mistake, warranted valuations and actual valuations only meet a couple of times a decade, but it is worth waiting for - no matter if you are a seller or a buyer. Then there is always, sooner or later over- and undershooting. There is however no reason to actively wait for that; just note that when it does occur, don't get nervous, rather use the opportunity to up the bets you already put in at the warranted valuation. The single best valuation measures ignore current profit margins altogether or adjust them to some kind of historical average. 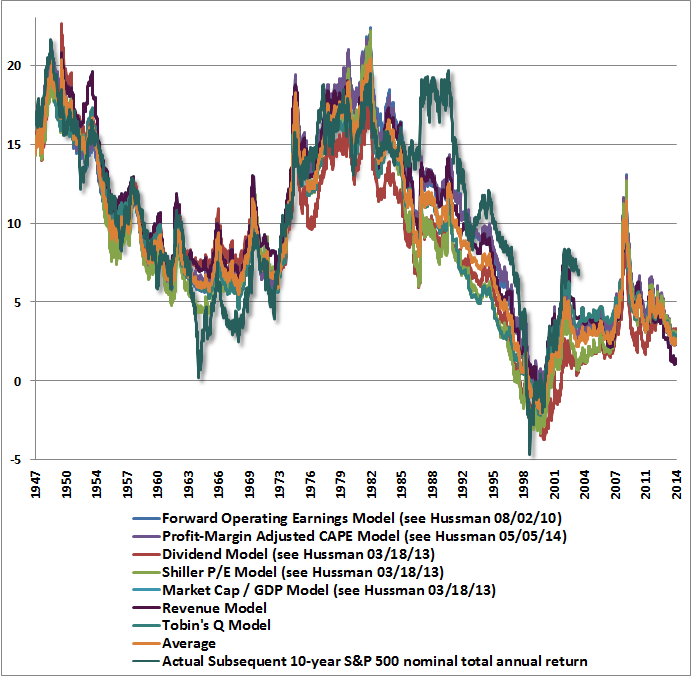 John Hussman does a very good job of presenting a handful or more of alternatives in his weekly comments, such as non financial market cap to GDP and Price/Sales and Shiller Cyclically Adjusted Price/Earnings. In his most recent juxtaposition of these he concluded that given current valuations that are more than 100% above the historical norm, we can expect at least 8 years of zero total returns by investing in the S&P 500 index. 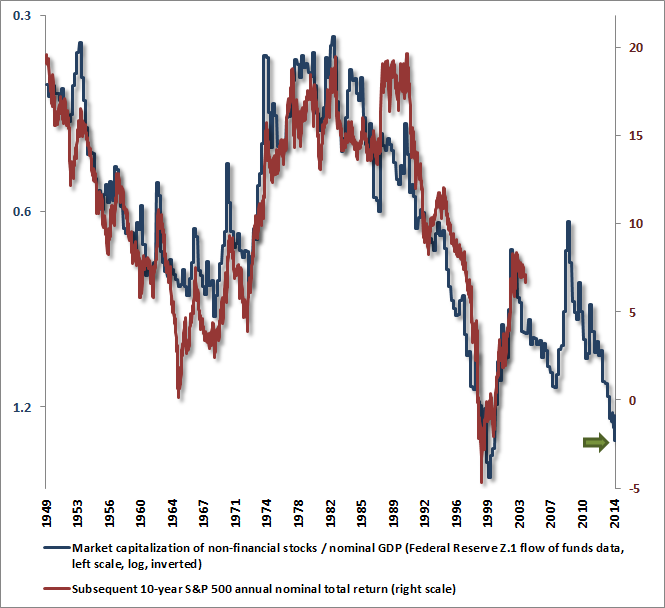 Given Mcap/GDP the coming 10 years total return including dividends for the S&P 500 index will be negative! And that is just discounting a normal 6% annual profit development and normal valuations, no undershooting whatsoever on either factor. The worst of it all, if you are long or have no alternatives, is the negative feed back loop that likely ensues. After the initial drop, things tend to look cheap all the way down, due to lags in the system. Leverage will be reported with a lag, employment with a lag, profits with a lag, margin debt with a lag and so on. Only stock prices are real time and once they start going down stocks can start to look cheap a very long time before the actual bottom. And that is not even considering an undershooting of valuations or fundamentals, not to mention both at the same time. Imagine the opposite of the current secular peak. We are here because of a long (albeit feable) upcycle, extreme leverage, extreme corporate profit margins, extreme fiscal and monetary stimulus and not least extreme valuations. Imagine a secular bottom with extremely low valuations coupled with extremely low corporate margins and a willingness through society to reduce leverage instead of increase it. Imagine interest rates are actually unusually high instead of practically zero. I don't count on such an extreme low, but they have occured a couple of times during the last century and it was exactly after extreme periods like the one just passed (I assume the stock market peak occured on July 24, 2014). So, noone should build their market strategy on the fruition of such a low, but everyone should be able to withstand it. My plan is to start buying about -40% from now and then be able to keep buying over the following 2-3 years and still have a buffer to buy even more if the market goes down from there. I will focus on stable Buffett-type business models with solid dividends and treat my investments as if they are very long term bonds. I already have a list of prospective investments and, yes, it will appear here sooner or later.